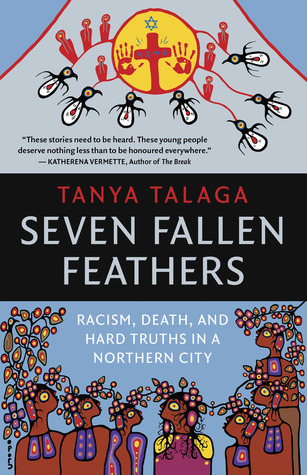 Seven Fallen Feathers: Racism, Death, and Hard Truths in a Northern City is one of those books I wish didn’t exist but am so grateful it does. Over the past few years, I’ve seen my city come up in the national media from time to time—and often related to Indigenous issues, such as the deaths or inquests of the students in this book. But after the interest in those stories dies down, and the spotlight of the press turns away, life in this city goes on. Nothing really changes. Tanya Talaga, by investigating and piecing together the stories of these seven deaths, and by putting them in the larger context of our colonial history, has created an enduring record that—I hope—is more difficult to ignore. I’m going to review this book first for a general audience, then I’m going to get into my reaction to it as a settler from Thunder Bay. Trigger warnings, obvs, in this book and review for discussions of suicide, violence (particularly against women and youth), binge drinking, and racial slurs. Seven Fallen Feathers is not about blame; it is about responsibility. We all have a responsibility towards children, as our future. The government has a responsibility towards Indigenous peoples—it acknowledges this, even if it doesn’t always act on it. Settlers have a responsibility to understand how the actions of our ancestors have resulted in a broken and hostile system of multiple genocides. Talaga pulls no punches in these respects; she has a quotation about cultural genocide right up front from the Truth and Reconciliation Commission’s final report. That’s why this book is so important beyond the boundaries of the city in which it’s set. This is a story of seven deaths in Thunder Bay, yes, but it goes wider than that. It’s a story about the complacency of an entire country, of a whole population, to the plight of Indigenous peoples caused and continued by a settler government that doesn’t care. Seven students attending Dennis Franklin Cromarty High School died between 2000 and 2011, and the police and city did the utter minimum that they could do to investigate or prevent further tragedies. The jury roll shenanigans, the inquest recommendations—all signs point to a deadly spectrum from apathy to outright racism within our judicial and political system. Talaga puts the pieces together so clearly and decisively that no matter where you live in Canada, no matter how little you’ve tuned into these stories, you’re going to understand the situation. Context is so important, and that’s what Seven Fallen Feathers provides. Yes, it retells, as best Talaga can piece together, the night of each student’s disappearance or death and the days that followed. More importantly, however, Talaga connects these students’ deaths to the history of this city and this country. DFC, albeit run by an Indigenous education authority, is a response to and inheritor of the colonial system of residential schools that broke apart so many families over the past century. These students were only attending high school in Thunder Bay because their own communities don’t have high schools, for various reasons, all of which are ultimately attributable to the provincial and federal governments refusing to do anything about it. The governments have, through decades of inaction, proved that Indigenous lives (by which I mean their livelihoods, lands, education, culture, language, as well as their bodies) matter less than settler lives. No amount of Trudeau-style speechmaking or name-changing is going to ameliorate this single, sad legacy. We did this. We meaning not just settlers but entire generations of anyone who calls themselves Canadians. And we are still doing it. When we ignore Indigenous people who are telling us about communities with unsafe drinking water, without proper housing or flushing toilets, when we don’t care about the state of education in these communities—we are complicit. This isn’t about guilt for something that happened twenty, fifty, a hundred years in the past; this is about complicity in what’s happening right now, every single day. It’s happening all across Canada—it’s just more obvious, more brutally explicit, here in Thunder Bay. Thunder Bay has always been a city of two faces. The Port Arthur side is the white face and the Fort William side is the red face. Port Arthur lies on the north shore. It is built up on the gentle, sloping Canadian Shield. Two-storey brick houses line streets that run up and down the Shield, each with a beautiful view of Lake Superior as far as the Sibley Peninsula, where the stone-cold Sleeping Giant Nanabijou sleeps. The red side is located down by the Kaministiquia (known locally as the Kam) River, on the Ojibwe’s traditional lands near the base of Mount McKay in the flatlands known as Fort William. Except for one tiny enclave of grand homes near Vickers Park, built by the affluent of another time, the residential streets of Fort William are staunchly working class, small bungalows or two-storey homes in various stages of repair, most with a pickup truck parked out front. She’s correct, of course. It’s a little strange to see my city described so clinically, to hear her discuss the layout of streets I know so well, to hear Intercity referred to as “the demilitarized zone” or Victoriaville as a “poorly planned shopping mall with a 1970s vibe” (entirely too true), just because it’s the normal backdrop for me. But Thunder Bay really is divided this way, even if some of us residents don’t like to think about it. I sit here, typing this review in a two-storey (albeit non-brick) house that I bought in Port Arthur, and I won’t lie: I principally looked at houses on this side of town because it’s “nicer”. Such are the divisions of class and race made even deeper by colonialism. Similarly, despite this being my hometown, I have been ignorant of a lot of the ways racism manifests here. In part this is my youth—I was barely 11 in 2000, when DFC opened and the first of the seven students discussed here, Jethro Anderson, went missing and was found dead. And although there were a few Indigenous kids in my classes at school, the truth was that when I was younger, my world was very stratified. I never really interacted a lot with Indigenous people until I started working at the Thunder Bay Art Gallery in high school. I didn’t go to powwows or other cultural events (more so because I just … didn’t … go … anywhere, but still). Now a large proportion of the adults I teach are Indigenous, and I am much more directly connected to what’s happening in this city and in Northern Ontario. The crises affecting these communities reach right into my classroom. I knew about these deaths, about the inquest and its recommendations, about the myriad other issues. I bought Seven Fallen Feathers because I wanted to learn more and then to amplify it. Yet that doesn’t change the fundamental fact that my privilege insulates me from understanding how truly hostile Thunder Bay is to Indigenous people. It insulates me from ever having heard certain slurs tossed around in my company, though I totally believe Talaga when she says it’s commonly heard on our streets. I can read and listen all I like … but I’m never really going to know. Because at the end of the day, I’m safe on these streets. Indigenous people are not. And it’s shameful that it took me working with a large proportion of Indigenous people for me to finally start learning about these issues. Of course, this isn’t about me. I don’t mean to centre myself here and make this all about how I feel. I just want to share why it’s so important for fellow settlers of Thunder Bay to read Seven Fallen Feathers and keep an open mind. There is so much defensiveness in this city, on the part of the settler population, to any hint that we might have a problem. It’s gross. But speaking settler-to-settler, I get where that’s coming from, even if the people being defensive don’t: deep down, in your gut, you’re starting to wake up to the fact you’ve been duped. You’ve been able to live in wilful ignorance for so long that the idea you’ve been so blind makes you feel almost comically buffoonish—how could you have missed this? In such moments, often it is easier to succumb to the siren calls of cognitive dissonance and dismiss what’s right in front of your eyes: no, there’s no problem here; these are just tragic accidents, the result of too much drinking, of an education authority that can’t keep its kids under control, why don’t they just all relocate…. It’s easier to believe in the lies of colonialism than in what’s right. It’s uncomfortable, yeah. But what’s worse—some minor personal discomfort, or more people losing their lives? Thunder Bay has a racism problem, and it’s one that no amount of “Respect” campaigning is going to fix. Such campaigns are ultimately doomed to failure because they locate racism in individuals’ actions rather than in the systems that surround and support them. Yes, it was a single individual—Brayden Bushby—who threw a trailer hitch at Barbara Kentner, who would ultimately die from those injuries, while reportedly yelling “I got one!” But it was a system of justice long practised at ignoring violence against Indigenous people that resulted in police investigating “if” it was a hate crime and ultimately never upgrading the charges beyond assault. “Respect” campaigning won’t work if the costs of showing disrespect are zero. Canadians need to read this book. If you live in Thunder Bay, you need to read this and confront the hard truths of our northern city. If you don’t live here, you need to read this and understand what is happening here. I challenge you to read Seven Fallen Feathers, to hear the testimony of the families and teachers and Elders, and not feel your heart break seven times over. But what really matters is what you do after you read this. Will it be just another tragic tale? Or will it be time to act and demand change? If you read this and it changes nothing about your perspectives or actions, you are participating in the colonization of Indigenous tragedy; it becomes a spectacle, something for settlers to consume the way we’ve consumed the land and … well … everything else. You must read this, and then you must act: use your privilege to demand change from your governments, your schools, your organizations, and yourselves. Sign into Goodreads to see if any of your friends have read Seven Fallen Feathers. Ben, that is one great review, almost a book on itself. You have pinpointed in clear language the very real problems that people are happy to ignore. Racism is deep-seated. We learn it at home and pass it on. When it condoned and often rewarded by the government and the justice system, it is insurmountable. I pray Canada will experience a miracle that will make this tragedy a thing of the past. "complacency of an entire country" I agree so much. I spent a few hours flipping through it right after buying it. I'm still speechless for how to describe that what's been happening has been put into a mere 300 page book. thank you for such a well written review. you have encapuslated much of what went through my head as I read the text. We have a lot of work to do moving forward. I just finished this book minutes ago and I was agonizing about how to formulate my review. I feel that your passionate essay, so much more than a book review, is so eloquent that I should simply say "Read Ben's review. He says it all." No thoughtful Canadian can truthfully turn their face away from this never-ending pain. The utter failure so far of the Murdered and Missing Women enquiry is just another example of an all-talk, no-intention-of-solving-the-issue money waster that could better be spent on actual programs that work. I'm so frustrated every time this happens.